Just a quarter of the carbon dioxide generated by burning fuels ends up being recycled through the biological processes of terrestrial plants and animals, according to the National Oceanic and Atmospheric Administration. Another quarter of this man-generated carbon dioxide floats aloft in the atmosphere, and the rest, NOAA says, ends up in the drink. That amounts to 260 billion tons of carbon dioxide dissolved into the sea since the beginning of the industrial era — a good thing when it comes to reducing greenhouse gasses that warm the planet. 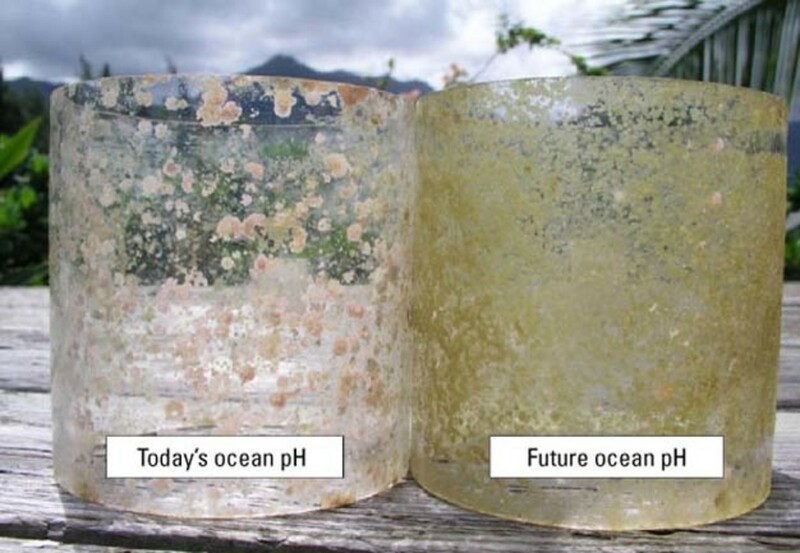 But, it also lowers the pH of the normally alkaline ocean water moving it toward acidity, and that is not good for marine ecosystems. In fact, at the recent Aspen Environment Forum, attendees labeled ocean acidification a "planet changer." And a 648-page draft bill on climate and energy introduced Tuesday in the House of Representatives includes language to "establish an integrated Federal program to assist natural resources to become more resilient and adapt to and withstand the impacts of climate change and ocean acidification." Ilsa Kuffner, a marine biologist studying the impact of acidification on coral communities, said the cascade of impacts can lead all the way to the dining room table. North Pacific salmon, for instance, depend heavily upon calcifying snails, known as pteropods, for food. Under conditions of lowered pH, the snails have difficulty forming their shells, putting their survival in jeopardy. New research from the University of California, San Diego&apos;s Victoria Fabry suggests their shells can fray after as little as two days&apos; exposure to the more acidic seawater we can expect in the near future. "Because pteropods are one of the North Pacific salmon&apos;s main prey, they lose that whole food resource when the pteropods suffer," Kuffner observed. The end result — we lose the salmon. If losing the salmon would be a disaster, Kuffner said losing the coral reefs would be catastrophic. 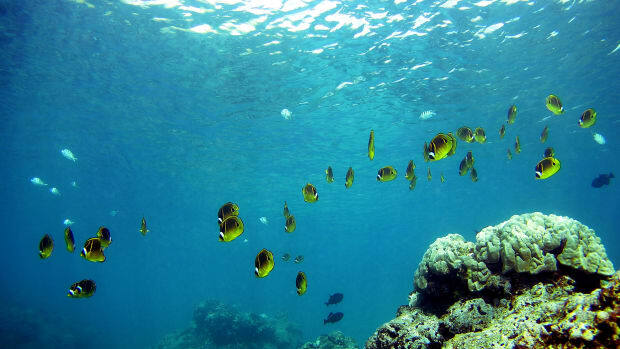 Coral reefs are major nurseries and sanctuaries for numerous fish and shellfish species, many of them economically important. Kuffner said researchers have recorded a decline in ocean pH levels, which began falling at the outset of the industrial era, from a mean pH of 8.25 during pre-industrial times to 8.15 today. And because pH values are recorded on a logarithmic scale, these figures represent a 30 percent swing toward the acidic. Experts say this rate of change is unprecedented in nature. The Intergovernmental Panel on Climate Change warns that if man-made carbon emissions continue at current levels, the pH of Earth&apos;s ocean could fall to about 7.8 before the end of this century, rendering seawater 150 times more acidic than today. 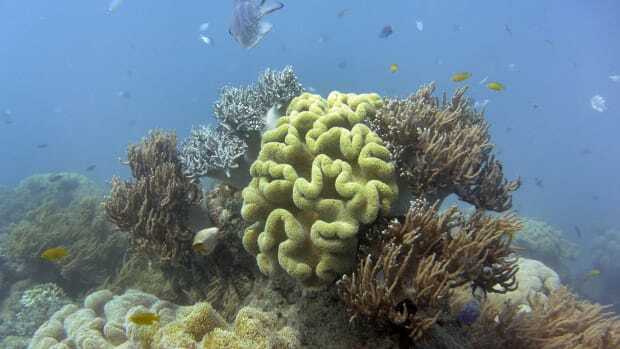 Species such as corals and shellfish, which use calcium carbonate to form their shells and skeletons, will find themselves particularly vulnerable in this changing environment. Furthermore, Kuffner said there is evidence that the negative impacts of acidification are already being felt. Kuffner explained that when carbon dioxide comes into contact with seawater, a series of chemical reactions occur, which normally result in a chemical balance favorable to calcifying marine organisms. "It&apos;s complex chemistry" and difficult to relate to a non-scientist, she added, noting that as a result this makes it harder to get broad public understanding of the issue. "It&apos;s much easier, for example, to explain and get the point across with respect to global warming because everybody can feel the temperature outside and has an intuitive understanding of temperature, whereas the concentration of carbonate ions in the ocean is a little more obscure and hard to identify with." Here&apos;s how it works: "You have this equilibrium amongst the different types of carbon molecules. Carbonate ions, one of the building blocks of calcium carbonate, are the end result," Kuffner said. "As pH falls, the chemical equilibrium in the water shifts away from carbonate ions, making them less plentiful. When that carbonate ion is less available, then they (the organisms) calcify slower." Kuffner said a colleague demonstrated the reaction in the lab using his motor scooter. He submerged one end of a rubber tube in an aquarium tank containing seawater, then attached the other end to the vehicle&apos;s exhaust pipe and started the engine. Kuffner says, "You could watch the pH readings from the water drop." Experts say even if carbon emissions stopped tomorrow, residual excess carbon in the atmosphere would continue entering the oceans, and pH levels would continue their decline for some time. And the unaided rebound to pre-industrial pH levels could take thousands of years. 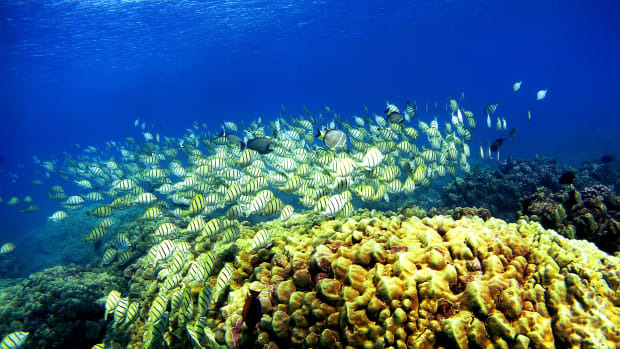 In 2005, Kuffner and a team of researchers from the U.S. Geologic Survey&apos;s Terrestrial, Freshwater and Marine Ecosystems Program began a series of experiments on the Hawaiian island of Oahu to study the ecological impact of acidification. They focused their work on a calcifying organism — crustose coralline algae — that&apos;s common from the tropics to the polar zones. According to the USGS, these algae provide the "cement" that hold the massive reef structures together, and they release chemical "cues" that encourage other reef life forms to set down roots in the colony. They created a series of mesocosms (controlled natural environments) in tanks on the reefs and supplied them with seawater, Kuffner said, noting that flow-through compartments allowed free-floating organisms to settle naturally in the tanks. To simulate the changes anticipated during the current century, they added small amounts of hydrochloric acid to selected sections of these mesocosms. In each of the mesocosm sections, surfaces were provided on which organisms might settle, so they could be easily observed. It was a unique experiment, she said, because "we weren&apos;t in control of what was coming in." The microbes, plankton, larvae, flora and fauna were left to organize themselves, more or less, naturally over several months. At the conclusion of the study, the experimental surfaces were examined. Not unnaturally, the acid treatment produced winners and losers. In the mesocosms reflecting current ocean conditions, numerous clusters of white granular calcifications indicated the presence of healthy communities of crust-forming algae (think crushed salt about the rim of an icy margarita — helps wash down the science). In contrast, these signs of calcifying algae were noticeably absent from the mesocosms challenged with acid where, unaffected by the lowered pH environment, algae communities of the fleshy variety — which do not utilize calcium carbonate — grew in abundance. These findings were reported last year in the journal Nature Geoscience. Kuffner said the connection between lowered pH levels and the abundance of crust forming algae shows "a very simple linear relationship." Further, she said the experiment demonstrates that lower pH alone can influence the mix of species in an ecosystem, in this case, by reducing the abundance of an important species of algae. These results leave "very little doubt" that before the end of the century "coral reef communities will look different from today." "One of the things we don&apos;t know is will the organisms be able to adapt." That possibility is more likely, Kuffner said, for those organisms that reproduce quickly, and go through multiple generations in a year, but it takes time for selective pressure to bring about useful adaptations. For corals, even a century is short notice. 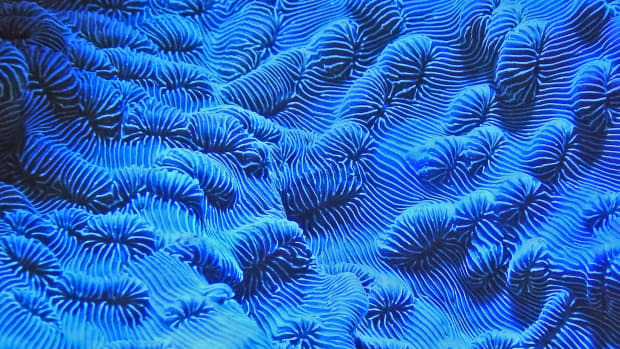 "A single individual coral can live for over 1,000 years," leaving few opportunities for evolutionary adaptations to occur. As vacationers converge on South Florida this winter, Kuffner will head to the reefs off the Keys, with plans to take core samples from the coral beds. 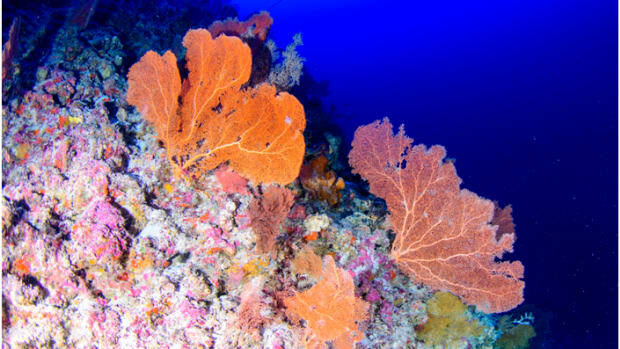 "Corals, like trees, lay down annual growth bands as they mature," she said. The core samples will enable researchers to look back and "see how growth rates have changed" in response to environmental conditions in the past. And that might have some predictive value in the face of the changes to come. "It&apos;s a retrospective and prospective approach," Kuffner said. "It&apos;s more of a long-term monitoring project, so it&apos;s going to be a little while before the payoff occurs."